The name Horn Street seems to be recorded first in the late 17th century (usually as Great Horn Street), but the road was part of the east-west axis along which Winslow originally developed. It has been suggested by the Bucks Historic Towns Project that the street's curvilinear shape marks the original southern boundary of the churchyard. 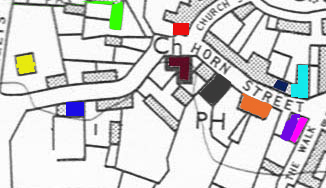 The name Horn Street may derive from the shape, or (more probably) from its association with the sale of cattle. 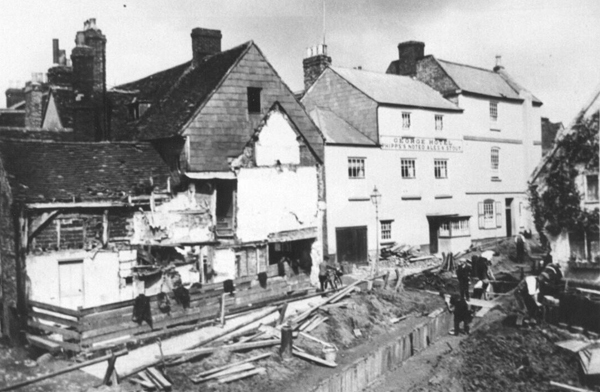 The photo below of the Market Square end of Horn Street shows the house which was occupied by the Grace family for over a century. The adjacent forge is to the right, not visible in the photo, behind the Fire Station. The building on the left is Heritage's undertakers. 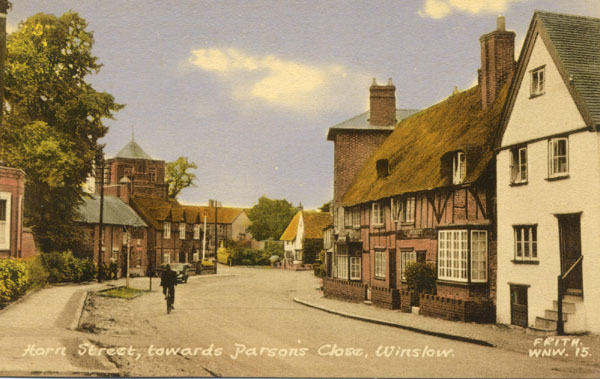 Winslow Rural District Council bought 2 Horn Street in 1902, and knocked down most of it. The Buckingham Advertiser (7 March 1903) reported: "The improvement widening the Horn-street corner of the Market-square has now been completed, as far the public are concerned, the placing of the pavement some yards farther back making a much wider approach, and doing away with a very sharp and dangerous corner. The house, however, still presents a very unsightly appearance." 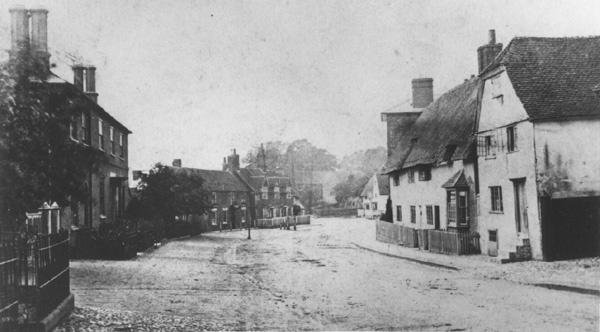 The house had been in use as Hilton's "Booteries", and previously it had been, among many other things, a hairdresser's, a grocer's and a pub called the Currier's Arms or the Duke of Cumberland. The Council sold what remained in 1904, and the refronted building was later Heritage's undertakers and the Corner Cafe (now a private house). If you compare the 1880 and 1978 maps (below), you can see how much of the original building (of which there don't seem to be any photos) has been lost. The dotted / broken lines mark the pavements. All the neat and valuable HOUSEHOLD-FURNITURE, and other effects, of MR. AUGUSTINE SEATON, of Winslow in the County of Bucks, Butcher; Catalogues of which will be delivered in due Time at the Bell Inn, and at the Auctioneer's, in Winslow aforesaid. Lot III. An inclosed Close of rich Pasture Ground, situate and lying in the Parish of Winslow, known by the Name of Angle [sic] Close, and now in the Occupation of the said Mr. Seaton, containing by Admeasurement one Acre. This Lot is Copyhold of Inheritance, held of the Lord of the Manor of Winslow, subject to a small annual Quit Rent of 3d and a Fine certain of two shillings upon Alienation. Lot IV. A new Brick-built Messuage or Tenement, situate in Great-Horn-Street, in the Parish of Winslow aforesaid (Copyhold of Inheritance, and held of the same Manor), now in the Occupation of the said Mr. Augustine Seaton; with a complete Butcher's Shop Barn, Stables, and other requisite Outbuildings thereunto belonging, subject to a Quit Rent of 4d per Annum, and Fine certain. On Friday the 27th Day of December, 1805, between the Hours of Two and Five in the Afternoon, at the House of Mr. R. Barton, Jun, known by the Sign of the George, at Winslow, Bucks. A COPYHOLD MESSUAGE or TENEMENT, with large Barns, Stables, Garden and Close of Pasture Land, thereunto adjoining and belonging, situate in GREAT HORN-STREET, in the Parish of WINSLOW, and now in the Occupation of Thomas Hogston and William Turner. ALL that substantial brick-built MESSUAGE, divided into TWO TENEMENTS, situate in GREAT HORN STREET, in WINSLOW aforesaid, with the out Buildings thereto belonging, now in the Occupation of Mary Hazzard and Mary Webb. 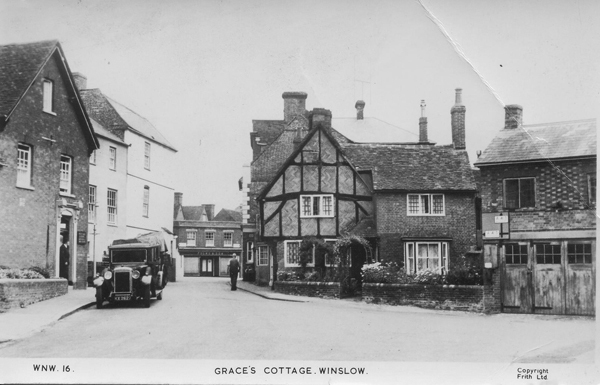 The Premises are Copyhold of Inheritance, held of the Manor of Winslow, with its Members, and equal in Value to Freehold: the Fines are certain and very low.- Possession may be had at Lady Day next. For a View of the Premises, apply thereon; and, for further Particulars, to Mr. W.M. WILSON, Solicitor, and the Auctioneer, both of Winslow aforesaid.